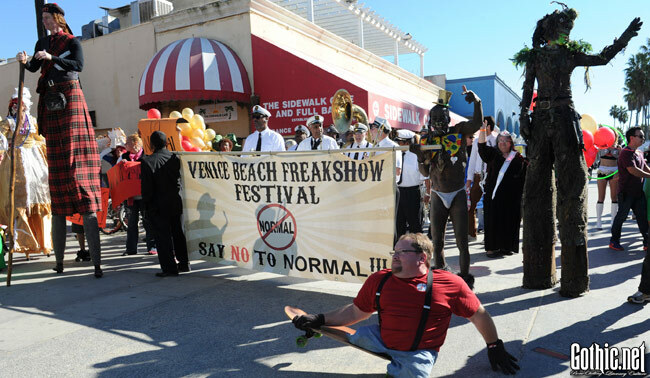 On the season one finale, the Venice Beach Freakshow brings us a “Freakshow Festival”. Todd waxes on the idea of ‘normal’ and has the notion for a festival, a freakshow family reunion of sorts. He sees it as becoming the biggest event in sideshow history. That’s a big boast, right there. Todd looks at the word ‘normal’ as being a derogatory term, instead of the word ‘freak’. For the festival, he envisions the entire cast coming together for a march that conveys that, yes, they are different and they’re OK with not being normal. A special guest, Molotov, is introduced, and all of the characters from this season as well as some never before seen look to be making an appearance for this show. Molotov is looking for an assistant, and Brianna steps up to the plate. As the crowd gathers outside, Todd touts the wares for the upcoming festival, barker style. For a little teaser, Brianna is put on the Wheel of Death, and Molotov starts throwing the knives. Just for extra added tension, there is a wicked wind when they are performing this stunt. On his practice round, he hits three out of four, but it’s that one that didn’t make the mark that has Brianna deep breathing. As Brianna takes to the wheel, Molotov lights the blades and throws them with success. Murrugun is going to reveal a new and perhaps deadly stunt that involves four sharp swords that will drop on top of him, with very little room for error. Todd and Danielle are visibly shaken when they see what he’s proposing to do, and I gotta say that it’s making me squeamish, too. Ah, that wild man Murrugun. It turns out that Todd has the largest collection of two-headed animals that exists. And one of his newest members is the cutest little baby turtle, with two heads, of course. He will name them Teeny and Tiny. Adorable. The freaks are all pumped up for the march, and ‘No More Normal’ stickers are handed out. The parade is on its way, Mardi Gras style. There is much celebrating and the amount of people that turned out to march as their own unique self is inspiring. After the march, Todd introduces each of the cast members individually, and Murrugun is prepped to do his new act. As the audience stares on in tense silence, Murrugun places a platform with swords attached to it on a pole and balances it precariously above him. He pauses, then pulls the pole out and lies down as the swords fall into place around his body. No mistakes here. Inside the freakshow, the acts continue with Asia as The Electric Lady, and Morgue performing his unsettling large metal hook through his head act. This brings an end to a season full of interesting and unique acts. It’s now time to say goodnight to Todd and his Freakshow friends. Thanks for the strange and unusual memories, folks. Posted by Amber Keller on Thursday, April 4th, 2013. Filed under Dark TV, Headline, Lifestyle. You can follow any responses to this entry through the RSS 2.0. You can skip to the end and leave a response. Pinging is currently not allowed.